Tyler gave me hell for not updating this blog more often, but I’ve been busy, and when I come in the house there is always some one here to visit with lately and I hate to ignore my guest Kelvin from Denmark. We ride most days and we’ve doctored cattle and worked on corral fences. I think we will take a quick trip to Sheridan. Probably won’t update this too much until after Kelvin goes home. Shipped a saddle off today. Did some work in the house and tried to check into some boots that Kelvin had ordered but evidently the business has went under. After dinner we rode out and the sun was shining. We were looking for a bad eyed heifer. Found the lost yearling. Just as I figured, he was smaller and had a poor brand and fit right on with the others here. We then found and doctored the heifer and kicked the last few out of a pasture and shut them off. Tomorrow we may load a few that are dry and haul them to St Onge. Sheep dog trails are going on in Sturgis so if we do we will stop and check it out. My yearling guy came yesterday and loaded the one lost steer we found and another who has a bad foot. The bad foot one he will take home and they will fatten and butcher him. Kelvin and I went down to Philip and watched the sale. The cattle weighed a little less than I thought they would, but they were pretty straight sided. Market seemed off to me. But they are gone. We drove over to Rapid and I got my new glasses. Kelvin did some shopping and then we came by Sturgis, got groceries and came home. I need to finish up a saddle and ship it today and then go ride and look for one last steer. 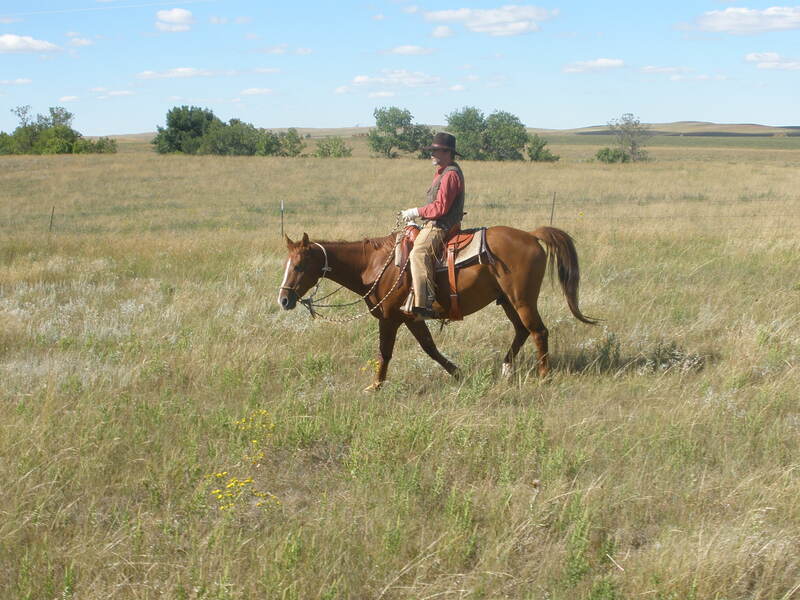 Heres a picture of Kelvin riding Dean, while we were looking for the lost steer the other day. Been busy and haven’t been here for a while. Worked on the Centennial celebration this past week. Went to Rapid on Thursday and was on the local news with a neighbor lady. Then we picked up stuff for the celebration and headed for Sturgis where Cindy had my pickup. We picked up more stuff and headed home with it. Went back on Friday and picked up Kelvin at the airport. He will be here for 3 weeks. We also picked up Chance and one of his sister in laws, CJ. She was coming to, watch the urchins so their folks could work at the celebration. Chance and Kelvin rode over early and were there to help park cars. 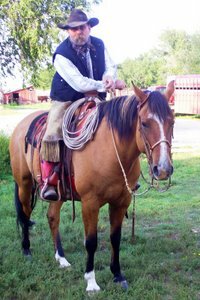 Tate and I went over a little later with the team and a saddle horse. Got all the wimmen and kids picked up and we went thru’ the parade about 6th in line and dropped the wimmen off and headed home, all horses and the wagon. Cleaned up a little and headed back over just in time for the last entries. 60 some in the parade and it lasted an hour. Then we had a huge group picture and the history part where some of the older ones who live around here and some who grew up here told some tales from the past. We had quite a few from the audience get up and tell some stories. Great time. Got done and they feed everybody and their brother who showed up. Then the band started playing. Cindy and I danced one dance and came home about 8. Man, we are getting old. But she had been over there and going since 8 am. We laid in bed and wished our aching legs and feet would quit aching! The next morning I went back to help clean a little and then home and got my crew going about 8 and we went and sorted cattle and shipped. Started at 8, came in the house at 6 and here came more trucks. Loaded them and went and set gates and came back about 7:30. We were short two head so Kelvin and I rode most of today looking for the lost ones. We found one. The owner is coming tomorrow to pick that one up and also one that has a real bad foot that he hopes to fatten to butcher. I don’t know what I will do tomorrow, but I think I will go watch the cattle sell and get groceries. This is from a blog written by a lady from Gov. Palin’s hometown. I suggest you go read the whole thing at http://mukluk.wordpress.com/. Man, the lefties are scared of this woman! Governor Palin is incredibly courageous. Any one of the good ol’ boys she took on in Juneau could have quite easily have had her “taken care of,” something all of them were capable of, but she waded into their dens of iniquity without a qualm, and bested every one of them. The Left has finally showed the world what it is really made of; what cobwebs, cockroaches, and rat droppings infest their twisted hearts. it takes a certain kind of person to attack a person they know nothing factual about, and use her own children to do it. The truth is out about their real motives now, and from now on, the American news consumer is going to take everything they hear or see on tv news, or read in their mainstream magazines or newspapers with more salt than they have in the past. They have effectively and literally sealed their own fate. They will never again enjoy the kind of credibility they had even five years ago. The era of the crusading leftist journalist has been killed, and the deathblow was dealt by the victim itself. The irony couldn’t be sweeter. Here’s the bunch from Devil’s Tower. Diane and Ken were also at New Underwood. Nice crowd and we had fun. Went to Devils Tower yesterday after church. This was the 14 year I have been going out there and lining up the performers. Had a great crew and the crowd enjoyed the hell out of them. Dianne Tribbit, Ken Cook and Paul Larsen. Diane and Ken and I will meet up in New Underwood today to do some more. Paul may show up also. I hope so. He does a great job of playing and singing and has a wonderful voice. Rained on me a little last night coming home. Supposed to be a good chance for rain all week. We’ll take it. I suppose some of the people getting everything lined up for our centennial celebration at Red Owl this weekend, will be bothered by that news, but we always need rain. this country is always about 3 weeks away from a drought! A friend from Denmark is flying in on Friday so I will meet him at the airport and pick up any last minutes things people need for the big doin’. Hopefully get my new glasses so I will be able to see with out smudges and scratches. I guess a neighbor lady and I are being interviewed on Thursday at the local TV station about out part, so maybe I can pick them uop then also.